Cycling Through Taroko Gorge Hualien, Taiwan, Day 6 (II) - Always Travelicious ! The Taroko Gorge of Hualien (太魯閣國家公園) is one of the most spectacular scenic reserves of Taiwan. (photo gallery here). I planned for a cycling trip because I didn’t want to whiz through the beautiful Taroko Gorge in a car and I thought hiking would be too slow so cycling seemed to be the right choice. We reserved our bicycles with Mr Lu online and picked up our bicycles from him at Sincheng (Or Shincheng) Train Station (新城站). He also provided transportation for us and the bicycles to Tian Xiang at Taroko Nationl Park. When most people visit Taroko National Park, they will start from the East Entrance Arch Gate (東西橫貫公路牌樓), making their way up to Shakadang Trail (砂卡礑步道), Changchunxi or Eternal Spring Shrine (長春祠), Yanzikou or Swallow Grotto (燕子口) , Jiuqudong or Tunnel of Nine Turns (九曲洞), and ending in Tian Xiang (天祥). This route is consistently uphill. For us, we reversed our route and we started in Tian Xiang, going back down to the East Entrance Arch Gate, so that we were always going downhill for an easy ride (yes we are lazy!). View from Wun Tian Xiang Park. Before we started our ride down, we visited the little church nearby Wun Tian Xiang Park. Cycling through Taroko National Park was an awesome experience. Taking an easy ride downhill, enjoying the breeze, the sun, the sound of the waters, the aroma of the forest and immersing yourself in nature. The grandness of the marble gorges made me feel so small and I wasn’t really myself, but rather, I was part of nature as well. We stopped by the National Park Mountaineering School and had some fun posing with our bicycles. There is the Lushui Trail nearby and you can lock the bikes on railings at the compound. There’s geological information about Taroko Gorge at the Mountaineering School. Cimu Bridge, or Motherly Devotion Bridge, is an excellent stopping location for sight-seeing. The bridge was built by the late president Chiang Jing Kuo in memory of his mother. We were glad at this point of our ride because we could spent as much time taking photos around the area. There’s also a Cimu Pavilion nearby on a higher position which provides a good view of the magnificient white marble valley with Liwu River running beneath it. 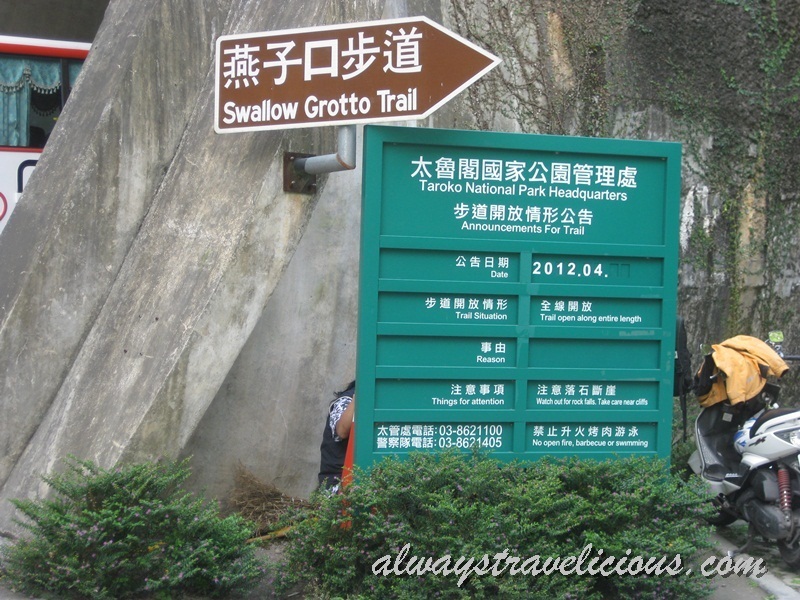 At Swallow Grotto Trail or Yanzihkou (燕子口). Watch out for potholes at Swallow Grotto. Up until the Swallow Grotto Trail, everything was enjoyable. The two-lane traffic was not too busy, just occasional cars and tour buses going downhill as us. However, the traffic became very very heavy by around 3.30pm or so. By that time, a lot of the tour buses and cars were making their way down, and curiously, a lot of tour buses were making their way up as well. It was actually quite scary because there were times I had huge buses following behind my bicycle, or I found myself having no space at all with one bus going up one lane and one bus going down the other lane. Most of the time we had to stop at the side of the road to let the busses, trucks and cars go by first. At certain places, the roads were so small I really had to step aside and almost into the drain at the very edge of the road. It was until this point that our ride started to become stressful. Our quick stop at Sipan Damn. It had beautiful blue waters. Our quick stop at Eternal Spring Shrine. And finally, we reached the East Entrance Arch Gate, which ended our ride in Taroko National Park. It was an amazing experience riding through Taroko National Park. Cycling brought me closer to the gorges compared to taking a cab ride and getting off at various scenic spots. I truly enjoyed riding through the park, though the heavy and dangerous traffic was unpleasant towards the end. Taroko Gorge is a beautiful place and I would recommend everyone to go, whether by cab, tour buses or cycling. But do take the safety factor and your cycling experiences into consideration before planning for cycling through the National Park. Address: 291 Fushih Village, Sioulin Township, 97253 Hualien County,Taiwan. Hi, may I have the contact for Mr Lu. Thanks. Hi sounds like a lot of fun cycling down that long hill! My friends and I are planning a cycling trip in Oct around TW and will include cycling up ( then down) Hehuan Mt. Just wondering which is the last stop up the hill where we can buy food and refreshments? Hi Ray, I haven’t cycled Hehuan Mt so I can’t help you there~ But if you need more info on riding in Taroko Gorge, let me know 🙂 Have fun in Taiwan. Hi just wondering what time did you start and finish (thinking of doing the same thing), how much time did you spend ‘exploring’ off the bikes at the various spots, was it all downhill and was it a weekday or weekend? Wondering if the traffic will be worse on different days. Thanks for any help you can give me! We are going to Taiwan next week and are so excited! Hi Lydia. We had a late start. We left the hotel around 10.15am, reached the peak of Taroko Gorge via car with the bikes at almost 11am. By the time we rode back to the bottom, mostly downhill and easy ride, it was about 4pm. We managed to cover most of the key attractions but we missed two of them – one was under repair and one because we were caught in the hour that a lot of buses were coming, so we didn’t stop for that attraction as we wanted to beat the buses – quite scary if you are caught with them! When we were there i think it was friday, there was still quite a lot of buses at around 4pm coming down, and also at the same down a lot of buses were still going up! So if you have an early start, hopefully you can avoid the peak hours with the buses. Have Fun! Thanks so much for the info! We had a great time, more people should do this! We started at Tiansiang at about 10am and got to the bottom at about 5pm. The traffic was not so bad for us, only one too close bus 😉 we went on a sunny Tuesday but there was traffic management in place due to a landslide so that might have helped slow the traffic. Loved that even though we were only coasting down the gorge everyone thought we were amazing for being on bikes! If I am already doing the various trails over 2 days in Taroko, do you think it’s still worth doing the cycle like you did? will you be able to return the bike at Hualien? meaning you ride all the way back to Hualien, or is it too crazy for a day? You can arrange that with your bike rental provider whether to pick up the bikes at the base of the gorge or in Hualian. If you are riding from Tian Xiang down the hill, the journey is a breeze so I don’t think it’s too crazy to ride back to Hualien – but that will vary according to individual’s fitness. Too crazy!! Definitely, especially if you actually want to stop and look at things in the gorge. Plus from the bottom of the gorge to Hualien is about 20km (so the same distance as coming down the gorge) which means you will have to pay the “taxi” amount again. Hi. Im thinking of taking my pre wedding shots there. I will be renting a taxi, will it be able to bring me to the different sites or i will have to walk a lot? hi. im thinking of taking my pre wedding shots here, will a taxi be able to take me to all the different sites or do i have to walk a lot? Hi. The taxi will bring you to right in front of the place so not much walking is required. Hi there, would you happen to have mr Lu’s contact number still? I’m already in hualian and would like to cycle down taroko tomorrow! Thanks! Hi! I know this is quite a long ago post, but I just came across your page from google. You rented the bikes at the bottom of the Gorge and had a car transport them (and you) to the top right? Does the car not travel through the gorge to get to the top? How long did it take? Sincheng train station is at the bottom also right? Hi. Yes we met the bike renter at the bottom of the gorge at Sinchen train station. He took us up the gorge with the bike which was about 30 40 minutes I think. Have fun. Hi. not sure if this is still active. can i check how much did it cost to get the bikes up and how much to rent the bike? is the person renting the bikes the same guy who brought up the bikes? to reserve, must we call/contact the guy who brought up the bikes? Thank you for writing this wonderful article. That is exactly what I feel. I can hear the sound of nature, and stop anywhere I want. That’s why I start the bike rental shop in Taroko. My families and I recently visiting Singapore right now 4-9 Aug. 2015. Hope there is a chance to meet you.